These photographs first appeared October 21, 2000. 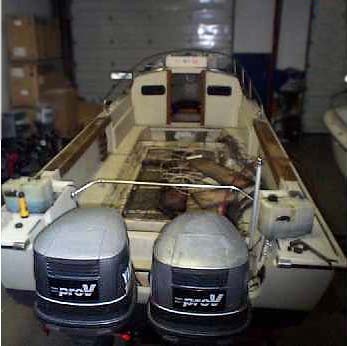 This week: the restoration of a big classic, Peter Ferguson's <PFerg@cybersol.com> 1983 Boston Whaler 25 Outrage Cuddy with twin 1986 Yamaha Pro-V 150 HP outboards. Peter's own narrative tells the story. "I bought her in the fall of 1999 in rather run down shape. The wood had been varnished and had turned black. The deck was so oxidized that I thought it was a white boat instead of desert tan. Also, the port engine lower unit was blown. I traded in my 1970 Currituck as part of the deal. I was sorry to see the Currituck go, but, financially I could not keep two boats. "The whole thing started when two friends and I attempted to go out boating on Lake Michigan out the Saugatuck channel one very windy day in September, 1999. The waves were running 12 to 14 feet as measured by NOAA's mid south lake buoy. We knew there was no way we could get on the lake, so we decided to amuse/frighten ourselves by seeing how far down the channel we could get before our nerve gave out. Yes, I know that this is a rather stupid thing to do and we do know better. 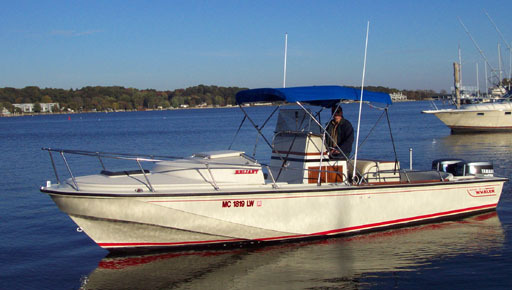 All three of us are in our late 30's to early 40's and are all licensed passenger boat captains by the U.S. Coast Guard. But, as my girl friend put it, boys will be boys. "When we returned to the marina where I had a slip for the Currituck, it just so happened there was a 25-foot Outrage Cuddy in for service and the owner was looking to sell it. I fell in love with the big 25 instantly and bought it about a month later, trading my Currituck as part of the deal. The photo taken at sunset is of my old Currituck with the 25 Outrage in the background. I think there is a Boston Whaler Rage in between the two. 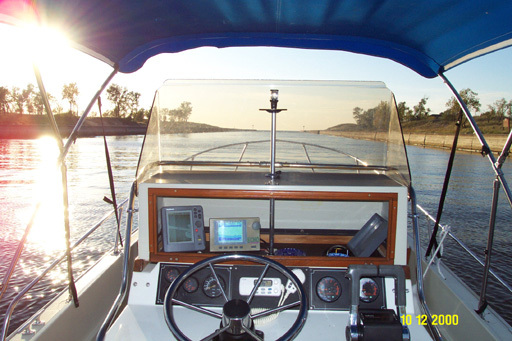 I realize that my old boat does not look like a Currituck. A previous owner had taken out the bench seats and installed a rather funky center console. 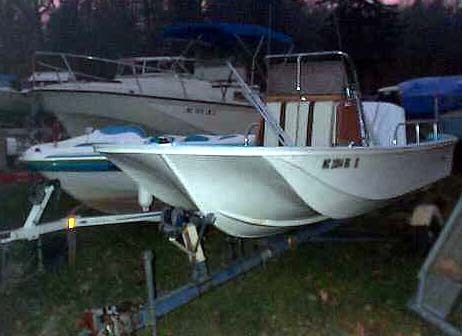 In November, 1999, Peter traded in the 16-foot Currituck for the big 25-Outrage behind it. "I started restoring the 25 at the end of March, 2000. I found that the fuel fill lines were rotten, and we ended up taking everything out of the boat and pulling up the floors. The wood under the floor panels was soaked with water, and it ended up having to be replaced with new wood. Some people were interested in what an Outrage looks like under the floor. Well, here it is. This photo was taken just after we had pulled the floors up in April and shows 17 years of dirt and grime. In the spring, the console and all floor covering panels were removed, and serious restoration began. "Due to several back ordered parts and the floor guy taking two months longer then he estimated to replace the wood under the floors, the project ended up going to nearly the end of August, 2000. After the restoration was complete, we did put the boat back together and she is beautiful. Everything has been restored, rebuilt or replaced. Hull has been buffed and waxed, the wood sanded, cleaned and finished with Cetol. The electronics and antennas have been replaced. The steering was completely replaced. And the engines were rebuilt along with the port lower unit. I owe so much to my friends who helped and advised me through this project. By the end of the season, September, 2000, the boat looked like this: beautiful! "Last Friday was another windy, September day on Lake Michigan. Waves were running between 8 and 12 feet. This time we were able to get out of the channel and the boat performed beautifully. We didn't even swamp the boat this time!" 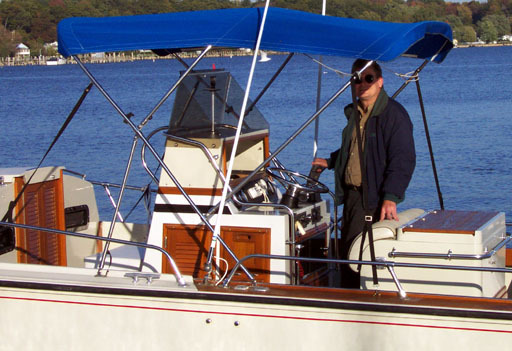 Proud owner Peter Ferguson at the helm of his restored Classic Boston Whaler. They don't make them like this any more. Lake Michigan lies ahead on a beautiful fall afternoon.